Now when you think of Spring, you typically think of flowers but I think of the melting snow....living in Jersey is nice because we experience all four seasons but I'm sick of winter already. 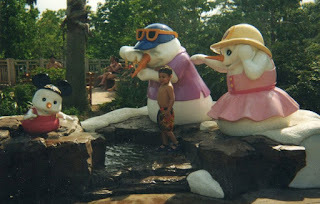 Actually, I've been sick of winter since December :/ So, I love this shot because it was at Blizzard Beach on a very hot day and even though there is a lot of 'snow & ice' all over-it looks like it's melting so it makes me happy!!! I don't want to see more snow, I want to see melting snow and the sun shining bright!!! I'm ready for Spring!! How about you? For more March calendar shots, stop by at Focused on the Magic!! Such a cute photo spot! What a cute photo I had forgotten about that!! Bought a smile to my face! I've never been to Blizzard Beach- I've always wondered if the fake snow makes you feel just a tiny bit cooler! Great shot. What a cute shot for March! I'm in NJ too and I am so tired of this cold. Ready for spring!! Great shot! I agree; I am so ready for the snow to be gone!